High-affinity antibody production through the germinal centre (GC) response is a pivotal process in adaptive immunity. Abnormal development of follicular helper T (TFH) cells can induce the GC response to self-antigens, subsequently leading to autoimmunity. Here we show the transcriptional repressor Capicua/CIC maintains peripheral immune tolerance by suppressing aberrant activation of adaptive immunity. CIC deficiency induces excessive development of TFH cells and GC responses in a T-cell-intrinsic manner. 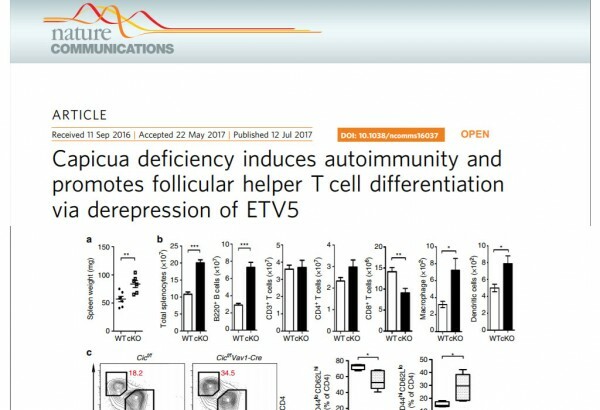 ETV5 expression is derepressed in Cic null TFH cells and knockdown of Etv5 suppresses the enhanced TFH cell differentiation in Cic-deficient CD4 þ T cells, suggesting that Etv5 is a critical CIC target gene in TFH cell differentiation. Furthermore, we identify Maf as a downstream target of the CIC–ETV5 axis in this process. These data demonstrate that CIC maintains T-cell homeostasis and negatively regulates TFH cell development and autoimmunity. 이전글Modulation of gut microbiota and delayed immunosenescence as a result of syringaresinol consumption in middle-aged mice.